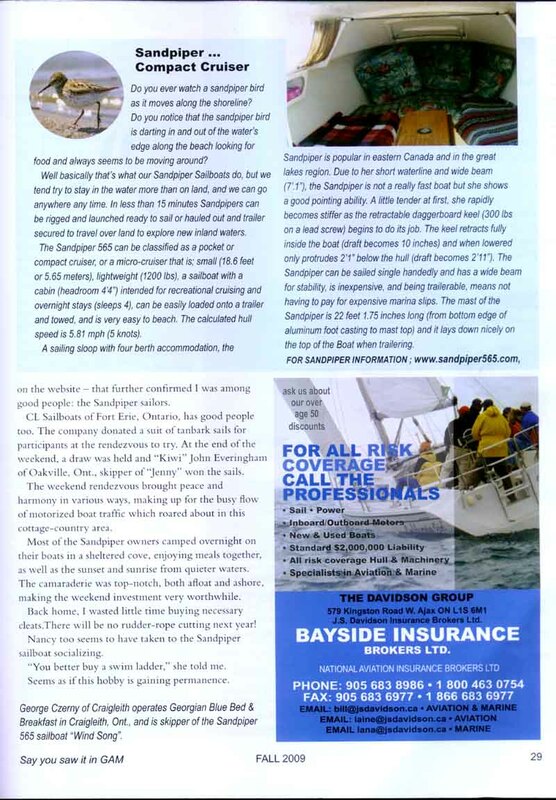 Sandpiper News Media, Stories and Press Releases:Click on the pictures to expand. The world could learn a lot about communication and co-operation, peace and enjoyment, from members of the Sandpiper 565 Owners Group. Sandpiper 565 owners from as far away as the Detroit, Michigan area towed their boats to Midland, Ontario, for their fifth annual “Rendezvous” in mid-August. Eleven proud owners of the Sandpiper 565, made Bay Port Yachting Centre their base and did an overnight trip to a sheltered cove at Beausoleil Island during the rendezvous which is held in different places annually. As I searched to buy a sailboat, I was drawn to the communication evident on a Sandpiper 565 website, which showed owners of this sailboat type as a caring lot. Not only did I learn a lot at www.sandpiper565.com, which is designed and maintained by Sandpiper 565 owner Neil Trudel of Sault Ste. Marie, but I also decided the Sandpiper is the boat for me. 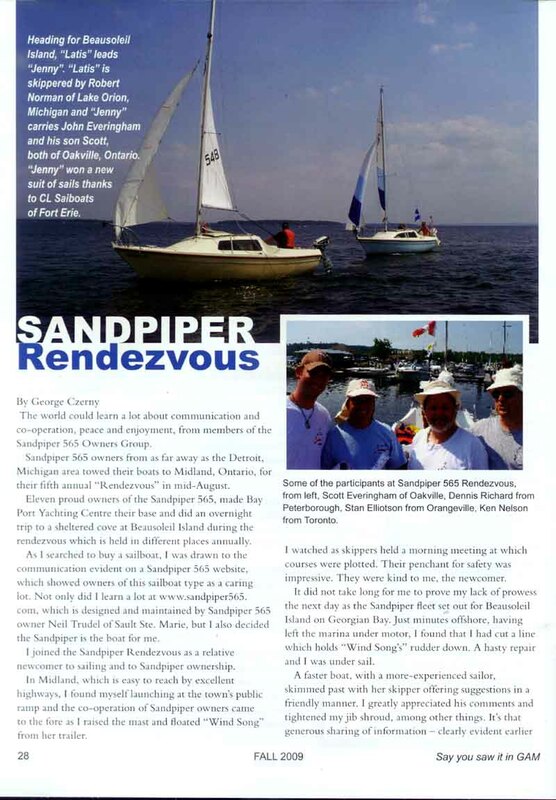 I joined the Sandpiper Rendezvous as a relative newcomer to sailing and to Sandpiper ownership. In Midland , which is easy to reach by excellent highways, I found myself launching at the town’s public ramp and the co-operation of Sandpiper owners came to the fore as I raised the mast and floated “Wind Song” from her trailer. Heading for Beausoleil Island , “Latis” Leads “Jenny”. “Latis” is skippered by Robert Norma of Lake Orion , Michigan and “Jenny” carries John Everingham and his son Scott, both of Oakville , Ontario . “Jenny” won a new suit of sails thanks to CL Sailboats of Fort Erie. I watched as skippers held a morning meeting at which courses were plotted. Their penchant for safety was impressive. They were kind to me, the newcomer. It did not take long for me to prove my lack of prowess the next day as the Sandpiper fleet set out for Beausoleil Island on Georgian Bay . Just minutes offshore, having left the marina under motor, I found that I had cut a line which holds “Wind Song’s” rudder down. A hasty repair and I was under sail. A faster boat, with a more—experienced sailor, skimmed past with her skipper offering suggestions in a friendly manner. I greatly appreciated his comments and tightened my jib shroud, among other things. It's that generous sharing of information — clearly evident earlier on the website - that further confirmed I was among good people: the Sandpiper sailors. CL Sailboats of Fort Erie, Ontario, has good people too. The company donated a suit of tanbark sails for participants at the rendezvous to try. At the end of the weekend, a draw was held and “Kiwi” John Everingham of Oakville , Ont., skipper of “Jenny” won the sails. The weekend rendezvous brought peace and harmony in various ways, making up for the busy flow of motorized boat traffic which roared about in this cottage-country area. Most of the Sandpiper owners camped overnight on their boats in a sheltered cove, enjoying meals together, as well as the sunset and sunrise from quieter waters. The camaraderie was top-notch, both afloat and ashore, making the weekend investment very worthwhile. Back home, I wasted little time buying necessary cleats. There will be no rudder-rope cutting next year! Nancy too seems to have taken to the Sandpiper sailboat socializing. "You better buy a swim ladder," she told me. Seems as if this hobby is gaining permanence. George Czerny of Craigleith operates Georgian Blue Bed & Breakfast in Craigleith, Ont., and is skipper of the Sandpiper 565 Sailboat "Wind Song”.